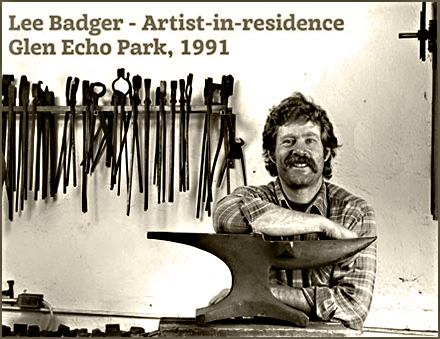 As an artist-in-residence in cooperation with the National Park Service at Glen Echo Park, Maryland from 1989 to 1993, Lee Badger taught basic blacksmithing classes and demonstrated blacksmithing techniques. The Glen Echo Table was a recurring demonstration. 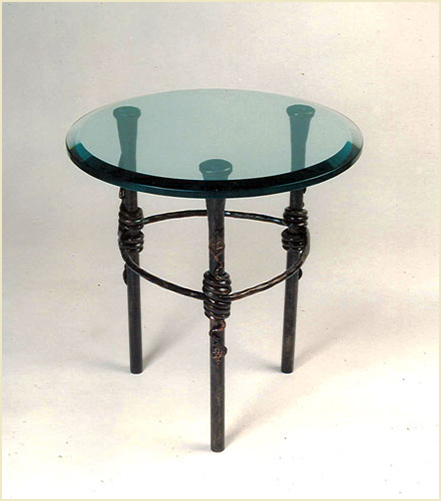 The table's parts require three basic forging processes: Upsetting; Drawing; and Bending. Upsetting The tables legs are thickened at the tops by striking the end of a hot bar, shortening and thickening it into a flared shape. This can also be done by dropping or knocking the hot end of a bar on an anvil. Drawing The legs are also lengthened and tapered by hot hammering them evenly along the sides, drawing them out into straight symmetrically tapered legs. Bending The stretchers connecting, supporting and spacing the tables legs require careful bending to hold the leg in place and in good form. It's done with hammer and anvil techniques, and with blacksmith's bending forks with sturdy, specialized tines.